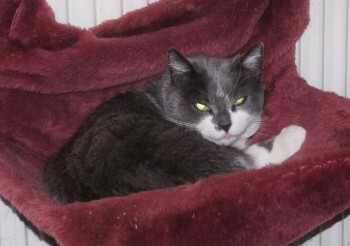 Rosebud is a beautiful predominantly grey with white patches, 8/9 year old, solitary cat. Sadly her beloved owner died at the beginning of the year and suddenly Rosebud found herself taken from the home she had known for so long to one she didn’t particularly like at first. Eventually she started to venture out of her bedroom and have a bit of a fuss; now she comes and goes as she pleases; exploring the fields during the day and coming back late afternoon for her tea and nap amongst the horse rugs. Rosebud would suit a country home – either on a farm, smallholding or equestrian yard. She loves to go exploring and if she had a warm spot to come back to plus good food, she would be in her element.